Are you a property owner or business owner in Somerville with a large and visible wall that you would like a street art mural painted on Email: Special Events Manager, Nina Eichner at NEichner@somervillema.gov to learn more! 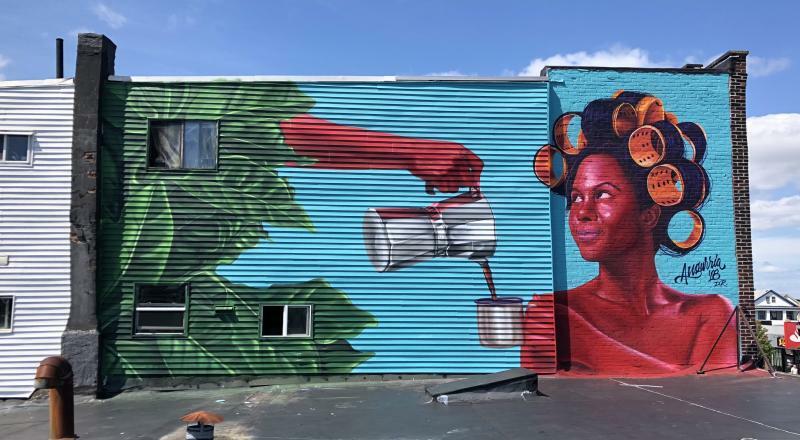 The City of Somerville got three new contemporary street art murals in August 2018 as part of the new Somerville Street Art Project. The project was the brain child of Mayor Joseph Curtatone who wanted to inject the City with more bright colorful public art! 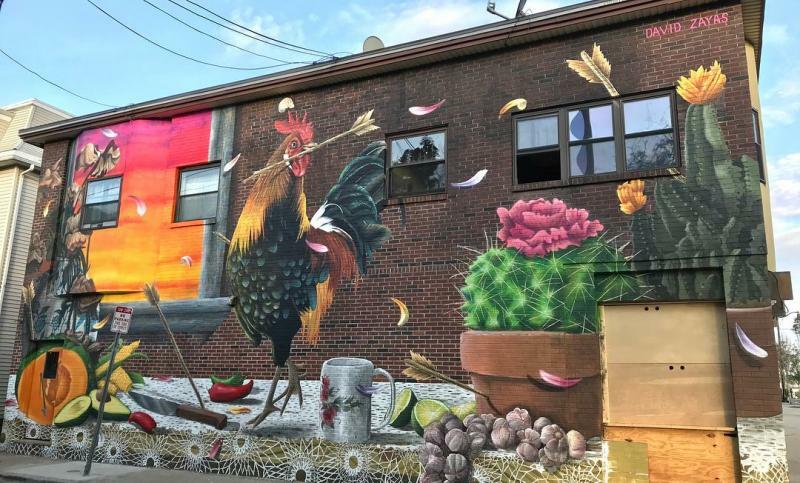 From August 21 through August 31, three internationally-renowned artists painted murals in the East Somerville and Union Square neighborhoods of Somerville. 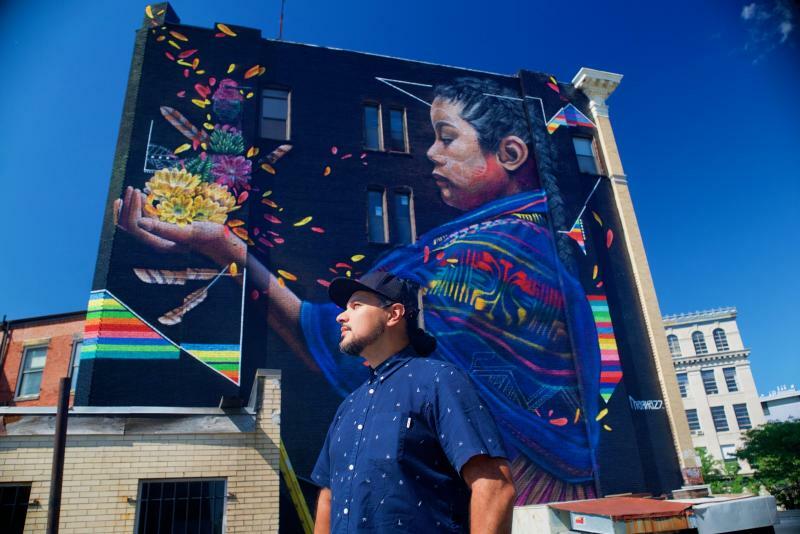 The artists who completed these murals are David Zayas from Puerto Rico, Angurria from the Dominican Republic, and Victor Quinonez "Marka27", who was born in Juárez, Mexico and currently splits his time between Cambridge and Brooklyn. 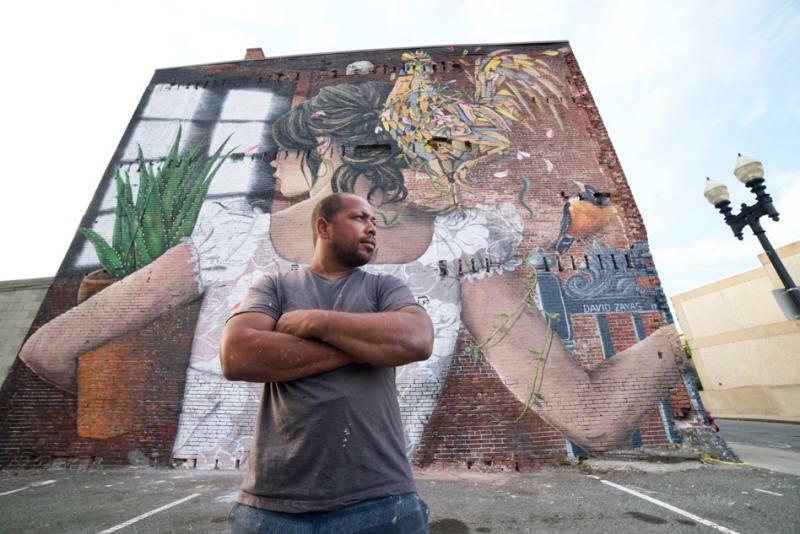 These artists painted contemporary street art on local walls that highlighted the diversity of their cultural heritage and the diversity of Somerville and its residents. We’re grateful for the business and property owners who worked with us throughout this process and allowed us to paint murals on their walls: Ola Café, Taco Loco, The Hamilton Company, and Urban Axes. We would like to thank our sponsors and partners for helping to make this project possible: Somerville Open Studios, Somerville Media Center, Union Square Main Streets, East Somerville Main Streets, Holiday Inn Somerville, Hope Depot, Spray Planet, Sherwin Williams, and Celeste restaurant. Mural, 112 Broadway: Angurria's mural "Doña Patria" represents Dominican culture. The mural is an expression of Dominican women's everyday beauty. Hair rollers are a huge part of the culture but they are worn behind closed doors. Angurria knew about them from spending time in the hair salon that his mother owns. The mural is in honor of his mother, who was a hair dresser, and all of the women of the Dominican Republic. Preparing your hair in rollers is something that many Dominican women do but it is mostly done in private and Angurria wanted to show that to the rest of the world. The coffee being poured for the woman is a role reversal from women serving men. Mural, 46 Broadway: Zayas' work focuses on human beings. mural, "Buenos Días" potrays a traditional table set-up with fruits and vegetables representing foods commonly used in Latin American cooking. The rooster at the center of the piece is the key figure and represents strength. The arrows symbolizes the blows that life gives us. The rooster takes one of the arrows that hits him and pulls it out with his beak catching the arrow signifies strength and resiliency against life's difficulties. Victor "Marka27" Quiñonez: Marka27 is an international street artist who works at the intersection of graffiti, vinyl toys, contemporary art, fashion and design. 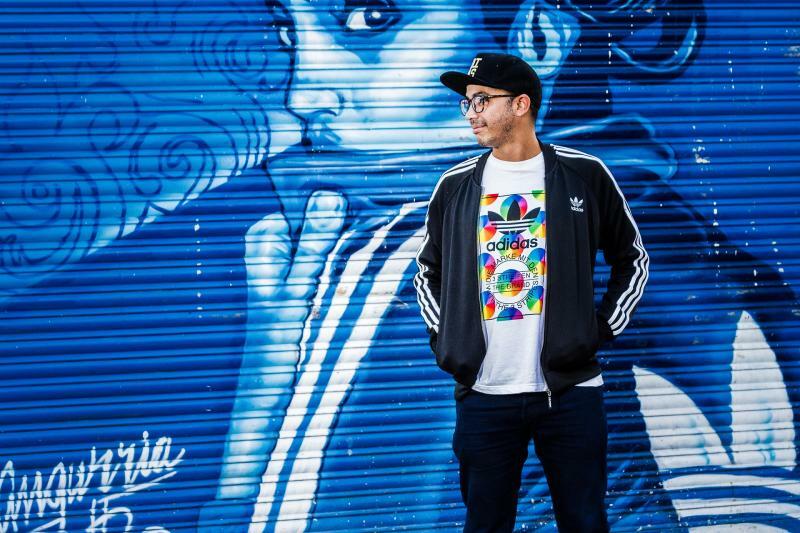 With paintings, murals, drawings, mix-media pieces and commissions for major brands, his robust palette blends elements of street and pop culture with Mexican and indigenous aesthetics—a signature look the artist has coined “Neo Indigenous.” Marka27’s work has become part of graffiti and street art history, but he has flourished as a product designer, gallery artist, toy designer and more. Marka27 has emerged as one of the most sought after muralists in the world, mastering his craft since before “street art” was even a term. He currently splits his time between his studio in Brooklyn and home in Cambridge, where he and his wife and creative partner, Liza, run their award-winning creative agency, “Street Theory." Mural, 2 Union Square: This mural "Rebirth" pays homage to Mexican culture and folklore. The masks are 900 AD Mayan masks representing life, death, and the lifecycle of being reborn again. At the center of the mural is an indigenous Brazilian child, honoring the "Munduruk" tribe to pay tribute to Somerville's large Brazilian population. 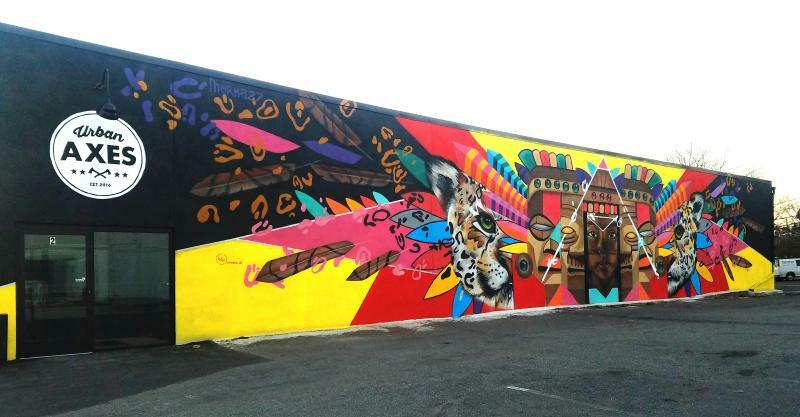 This mural is a representation of Marka's "Neo Indigenous" style.